Researchers at the Translational Genomics Research Institute (TGen) joined an international team of scientists in discovering how a protein from malaria could some day help stop cancer. 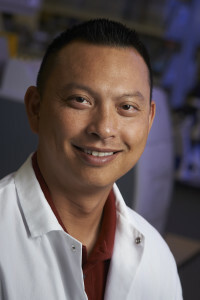 Scientists at the University of British Columbia, Vancouver Coastal Health and the BC Cancer Agency, working with those from Copenhagen, realized that the sugar molecule — oncofetal chondroitin sulfate — could be a target for anti-cancer drugs, and that the malarial protein, called VAR2CSA, could provide the tool for carrying such drugs to tumors. Malaria uses VAR2CSA to embed itself in the placenta — hiding itself from the immune system — by binding to oncofetal chondroitin sulfate. The results of the scientific study — Targeting Human Cancer by a Glycosaminoglycan Binding Malaria Protein — were published Oct. 12 in the journal Cancer Cell. “This is an extraordinary finding that paves the way for targeting sugar molecules in pediatric and adulthood human cancer, and our groups are vigorously pursuing this possibility together,” said Poul Sorensen, a UBC professor of Pathology and Laboratory Medicine and distinguished scientist with the BC Cancer Agency and co-senior investigator on the study. “There is some irony that a disease as destructive as malaria might be exploited to treat another dreaded disease,” said Ali Salanti, a professor of immunology and microbiology at the Centre for Medical Parasitology, at University of Copenhagen.